Let me start by clarifying - this isn't a review of one book, it is a review of four books all called Stories for Five, Six, Seven or Eight Year Olds and all edited by long time children's book publisher Linsay Knight. I personally don't really like short stories - I find them frustrating and want to know the rest. Except there isn't any 'rest'. Books of short stories are however brilliant for kids because they are manageable, satisfying and if the child likes one story in the book it encourages them to sample the others. And these books are particularly good examples of short stories for kids. Carefully selected, the stories are written by some of Australians best-loved children's authors including Paul Jennings, Andy Griffith and Morris Gleitzman. 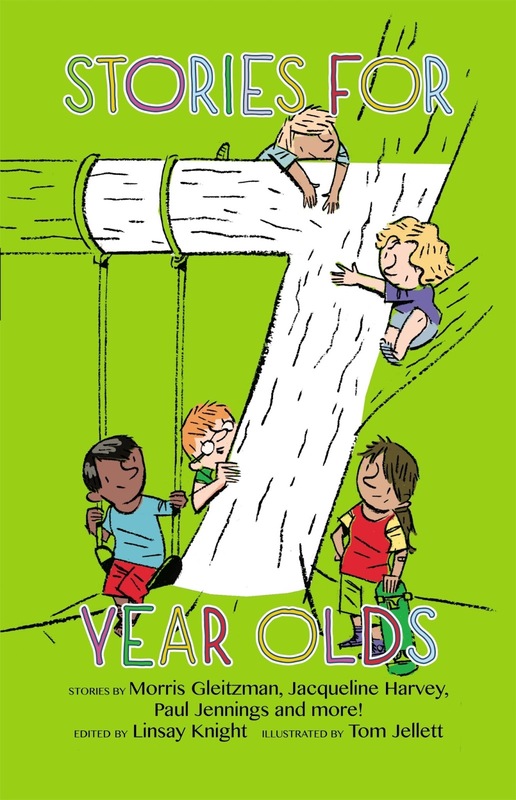 Some of the stories are funny and some are thoughtful, some are written in first person and some are written in third but the best thing about them is that, because each book is specifically written for a certain age group, they are age appropriate in content, font size and reading ability so they are an easy and safe choice for parents. The illustrations are by Tom Jellett, and the number of them varies with the reading age group, for example Stories for Five Year Olds has lots of pictures but Stories for Eight Year Olds only has one or two per story. Aiming a book at a single year in a child's life is a risk for publishers, by being so specific they limit the readership. BUT it does mean that the book can be tailored to the needs and interests of that age, rather than trying to be all things to all people. Who'll love this: Kids struggle to get through a 'whole book', and parents who are trying to introduce new genres to their children.